Gabriel Gómez Celaya (Guernica, Spain – Oct. 25th, 1973) is the General Manager of Marine Instruments since 2013. 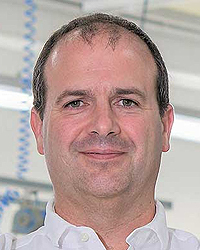 After spending more than 15 years working in different countries in Europe and Asia, where he acquired vast experience in automotive electronics, Gabriel moved back to Spain to become the GM of Marine Instruments, a world leader in the development and manufacturing of technologically advanced electronic equipment for harsh marine environments, smart oceans and sustainable fishing. Marine Instruments, an innovation-driven company that has continuously outperformed the market, has recently been recognized at the European Business Awards for its extraordinary performance, out of 33,000 organisations in 34 countries, with the award for Best Growth Strategy of the Year 2016/17. Gabriel holds a degree on Industrial Engineering from the Universidad del País Vasco and an MBA from HEC Paris.